A blog created to explore technology ideas around protecting the confidentiality, integrity, and availability of data. We work to deliver posts with effective tips for troubleshooting current technology issues in addition to tips for better organizing our lives utilizing technology as a tool. The information provided is designed to save time, alleviate frustration, and provide support while troubleshooting common technology problems and implementing new technologies. Adobe pdf files are a great way to share documents because anyone can download Reader for free which allows them to open pdf files. There are additional benefits, as covered in our post "The Best App for Merging and Modifying Files". This post covers some of the specific settings you can control when creating a link in an Acrobat document. Hyperlinks are simply text that has been programmed to link to another place. The link can be to a website, like the one used above, to another place inside the same document, or even to open an additional file. Depending upon where the hyperlink points to, the customizations available vary. This post covers some of these customizations, how they work and how you can control what they do. Different types of links provide different customizations. 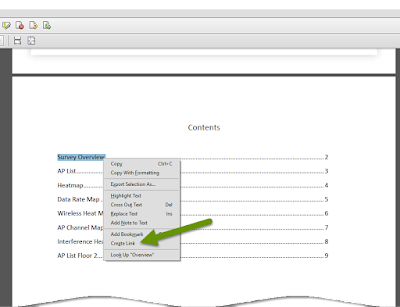 Zoom control is allowed for links that redirect to another location within the same document. The zoom feature allows you to change the focus of the destination page, showing more data than the rest of the document by zooming out, or focusing on important detail by zooming in. Links can also point to external documents which is useful for organizations housing shared documents. Lastly, hyperlinks can point to external locations such as websites for additional information. Highlight the text to link. 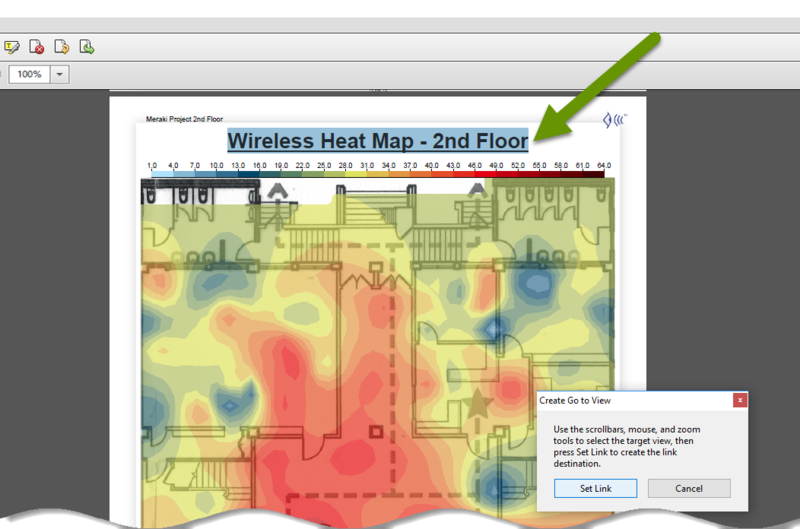 Right-click the highlighted text and select "Create Link". 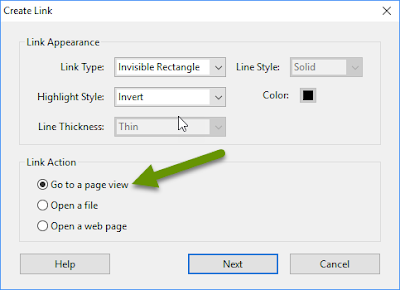 After clicking to create a link, in the Create Link window select "Go to a page view" under the Link Action section then click "Next". At the Create Go to View popup, scroll to the page or section to link to. 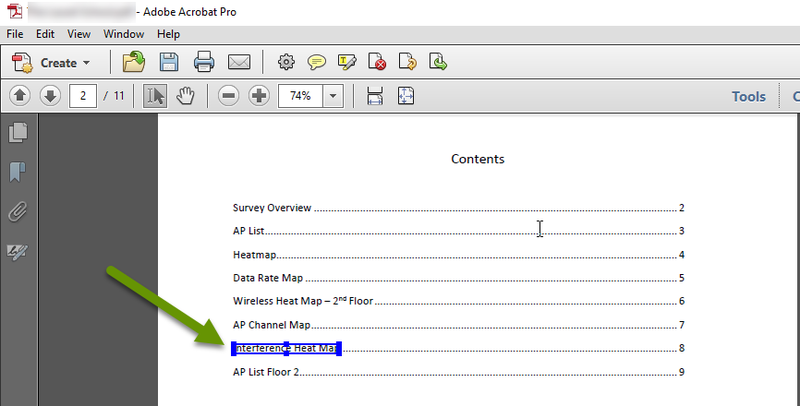 NOTE: Do not click the "Set Link" button until you have selected where to link to and set the zoom. This popup will remain available as you scroll until you have set those options and clicked the button to set the link. Highlight the top of the page or section the hyperlink will go to. Zoom the view by holding the control key and using the up and down arrows or scrolling the mouse wheel. Once the zoom is set to the desired view, click the "Set Link" button. In this case, the zoom needed to go from 100% to 74% to fit the entire page into view. 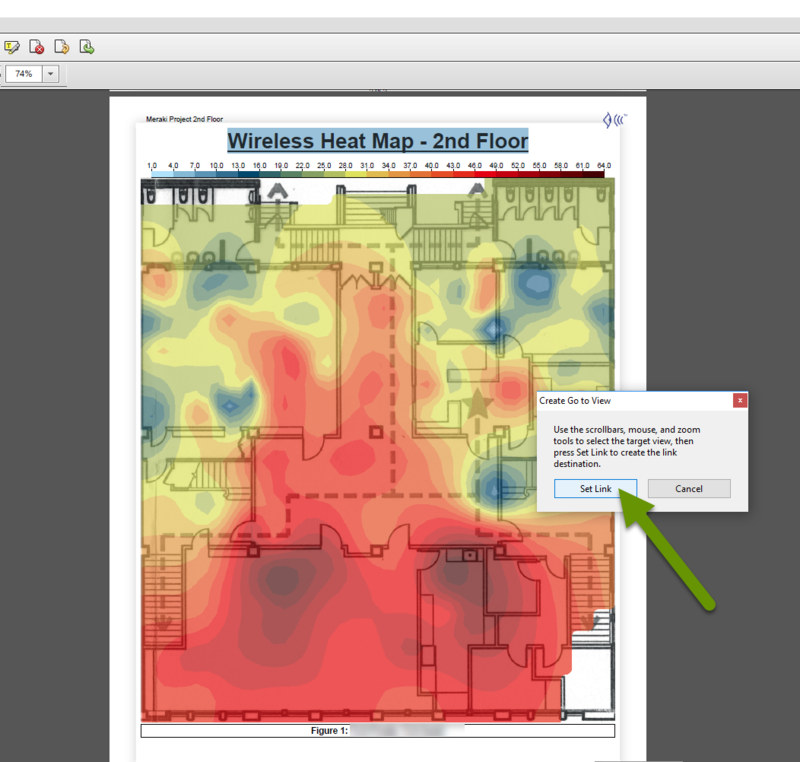 In this example, with the entire heat map in a single view it is easy to see where problematic areas might lie. Sometimes there are reasons to reference an external document rather than merging multiple documents. It might be that the information would only pertain to certain individuals or is useful reference material not required by the original document. 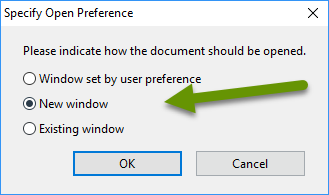 Whatever the reason, the easy way to accomplish this is to create a hyperlink pointing to the external document. NOTE: The external document must be available to the person accessing the original document and in the location originally pointed to for this to work. After clicking to create a link, in the Create Link window select "Open a file" in the Link Action section then click "Next". Navigate to the external file and click "Open". 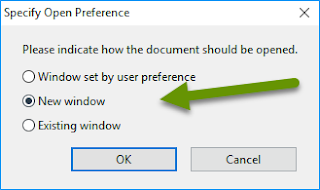 Pointing to a shared document is the best way to utilize this feature. 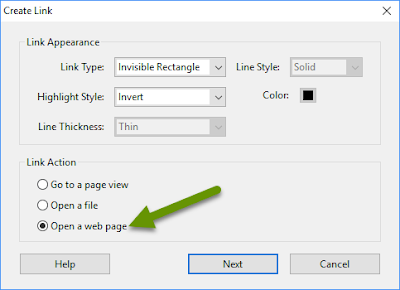 After clicking to create a link, in the Create Link window select "Open a web page" in the Link Action section then click "Next". In the Edit URL box, type in the URL you want the hyperlink to go to and click "OK". The highlighted text will show the new link has been created and when someone clicks the link, a web browser will open with the target destination. Whenever hyperlinks are being created in Adobe Acrobat, there are several options available. 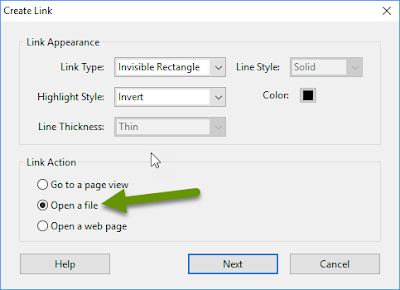 In addition to linking to another location in the same document, hyperlinks can also open external documents and direct someone to a website with additional information. Finally, when linking to a location within the same document the zoom level can be controlled which allows you to zoom in or out based on the needs of the data on that page. Configuring the zoom automatically displays the information in the best way possible. As always, there are often customization features hidden within options that can be super helpful once you know how to use them!